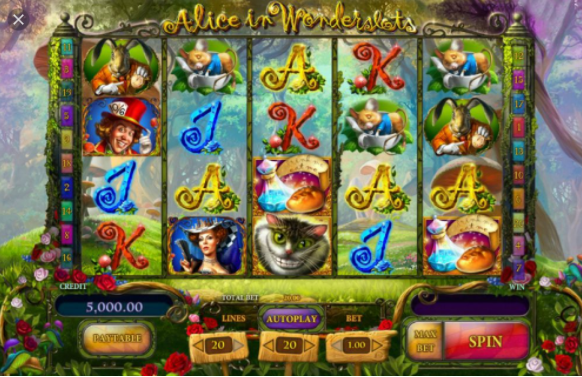 Alice in Wonderslots is surprisingly based on Alice in Wonderland, nevertheless, this still manages to be a great online slots casino. Despite its trippy aesthetic it features some great symbols such as the mad hatter, sleeping rabbit and some colourful letters that you must spin through to earn yourself a huge amount of free spins and cash rewards. Playson has been growing its portfolio with unique and exciting slot games for anyone to enjoy, whether they’re rookies or experienced players. The simplicity and clarity of their gameplay and the original and fun themes make their games some of the best in the online casino industry and definitely some of the ones that the players always return to. Playson are one of our favourites here at slot games online casino. 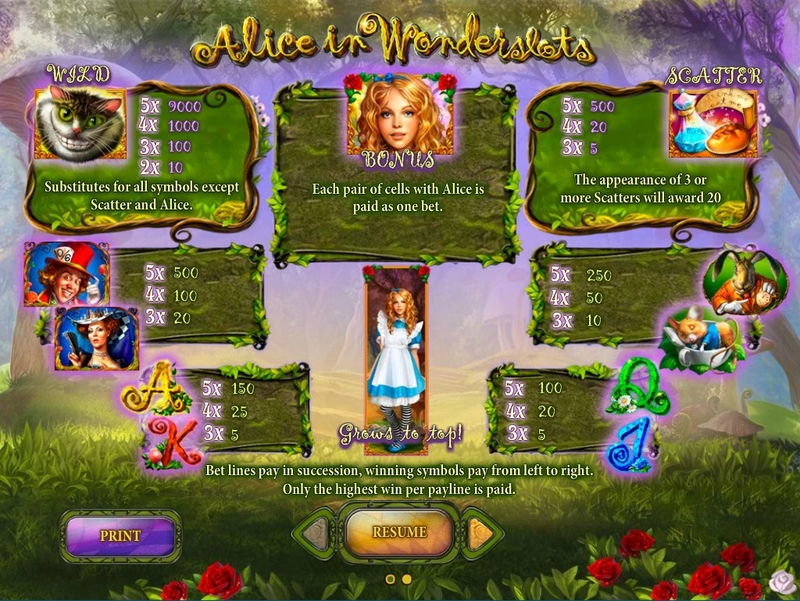 Alice in Wonderslots is an adaptation of the famous story written by Lewis Carroll, which had a big influence on a lot of childhoods. You’re encouraged to go down the rabbit’s hole, go bonkers and keep your eyes glued to all the prizes that might come out of nowhere. Wonderland is a fascinating place to visit, with strange and friendly (or not) creatures, of smiling cats, talking flowers and even an evil queen, whom you should try to avoid. Everything is taken to the extreme of imagination, so there is definitely no boredom in this land. Wonderslots is the improved version of wonderland, as it also contains coins, prizes and high chances of winning them. So follow the Rabbit and befriend the Mad Hatter, because they know how you can win big in Wonderslots! Alice gets lost in 5 reels and 20 paylines full of strangeness. The gorgeous graphics and vibrant colours enrich the slots experience and bring it closer to the original story, enchanting you right away. The reels are located among roses and summery grass, elegantly designed to fit the theme. The background music is there to tap into your sense of adventure as you start your journey. You can place your bets starting from 0.20 credits, with a maximum of 60 credits. The Cheshire cat will soon smile broadly at you, as you start winning. The adventure in Wonderslots will not disappoint. There’re plenty of features to keep you entertained and to give your luck a bit of help. The symbols are represented by some of the classic characters from the story, among which are fair Alice herself, the Hearts Queen and the Rabbit who is always late. The letter symbols are also enchantingly designed. The Cheshire Cat is the Wild Card of this slot game, and it substitutes any other symbol besides Alice and the Scatter, in order to form more winning combinations. The Scatter is represented by the ‘Eat Me, Drink Me’ special symbol, granting 20 Free Spins whenever you spin 3 or more of them. They can also be retriggered if the chance arises. Finally, Alice has the leading role- she stretches on the entire reel and each pair of cells that includes Alice on them is paid as one bet, so you can maximize your winnings. 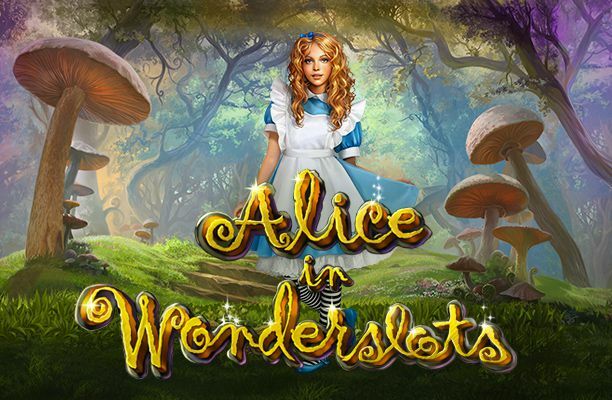 Alice in Wonderslots is a majestic slot experience that anyone with a sense of adventure will enjoy, especially since it is set in such a curious, odd land, where anything can happen, including a major win! This slot game offers a theme that will entertain almost anyone, as it is carefully designed with high quality graphics and sounds meant to impress. It is worth a try, as it will most likely leave you at least a little bit richer.